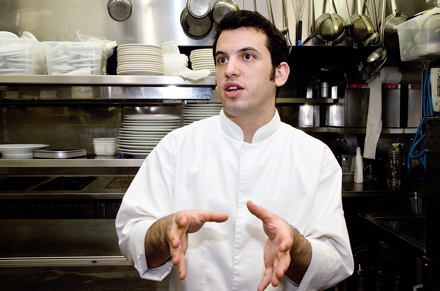 TORONTO, ONTARIO — Steven Salm has opened 14 restaurants in his career. That would be impressive for anyone in the restaurant business. Consider that Salm is 29 years old and the feat seems astounding. The transplanted New Yorker’s most ambitious and likely finest achievement debuted on a Monday afternoon soaked with sunshine and a champagne sprinkle of rain. It’s called the Chase and the Chase Fish & Oyster Bar — two restaurants, one building, four floors apart. Anyone would crown the combined 10,000 square feet of dining flair as Toronto’s new “It” spot without even pulling up a chair. The space is that phenomenal. 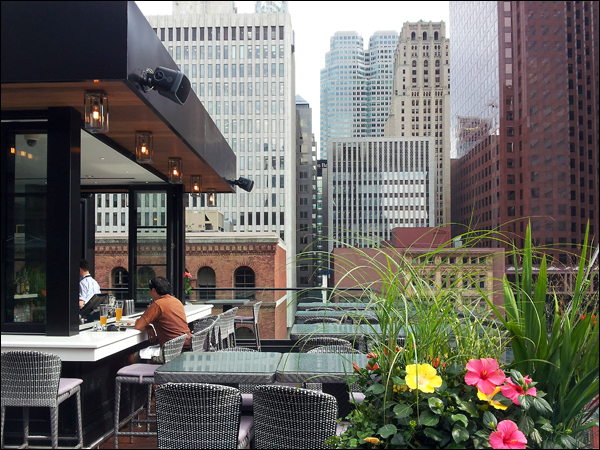 The rooftop, home to the Chase, features lounge chairs on the patio, a wonderfully stocked bar, and lavish decor in the interior that’s bracketed by attractive glass walls. New Yorkers Salm and David Chang of Momofuku have invigorated Toronto’s dining scene with culinary ambitions on a massive scale. Momofuku Toronto opened last September in a terrific 6,600-square-foot property adjacent to the Shangri-la Hotel. It features three restaurants, a cocktail lounge, and the recently opened Milk Bar. The Chase restaurants are in the historic Dineen Building, a circa 1897 heritage space. Executive chef Michael Steh oversees both two restaurants, which have separate chef de cuisines and diverse menus. The oyster restaurant, which debuted four days earlier, flies in fresh seafood from both coasts of Canada. It’s offerings include Oyster Po’boy Sliders ($11), a Lobster “Waldorf” Roll with candied walnuts and apple ($28), and decadent seafood platters ($50 or $110). The upscale rooftop kitchen sources local ingredients and also features some seafood dishes from abroad, including a delicious grilled octopus with pork sausage, salsa verde, and piquillo peppers ($23). Cat is one of the cheery staff members working at the Edelweiss Tavern. KITCHENER, ONTARIO — Thousands gather each fall in this city formerly called Berlin for the largest Oktoberfest celebration outside of Munich. At the Edelweiss Tavern, though, the good times go all year, thanks to owner Lorne Miller and his insistence on generous customer service. PARIS — One of the most innovative young chefs in Paris happens to be an Israeli man inspired by Asia’s cuisine and culinary philosophy. Yariv Berreby’s food at Kitchen Galerie Bis (or KGB), a recently opened restaurant near the Left Bank’s Latin Quarter, isn’t fusion or microgastronomy, he says. It’s more about what’s been happening in Paris in the past two years, which is an attempt to change traditional French food as well as the French diet. To retain the flavour without going to the tried-and-true richness of dairy products, Berreby uses lighter ingredients and modern culinary methods, such as foam that reduces the density of sauces without removing taste from a dish. Is Nicli in Vancouver the best pizza in Canada? 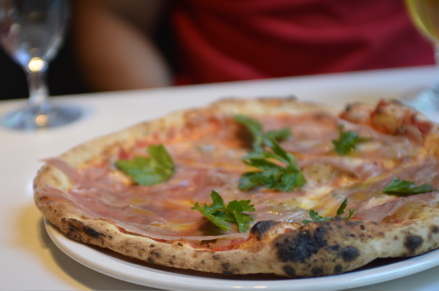 A pie with capricciosa at Nicli Antica Pizzeria, which is a wonderful new spot in Gastown. VANCOUVER — Vancouver already is home to Canada’s best Indian restaurant (Vij’s), probably its top sushi experience (Tojo’s), unmatched Chinese fusion (Bao-Bei) and some of the finest seafood restaurants in the country. And you just might be able to add best pizzeria to the roster of greats. Nicli Antica Pizzeria opened six months ago and the initial response was so strong the restaurant once ran out of dough to meet the demand, wine director and assistant general manager Matthew Morgenstern told me last week. When a contact strongly suggested I try the new pizza place in Gastown, I expected to walk into a New York-style parlour with an oven burning in front of me and a mustachioed guy in a checkered apron waiting to take my order for a slice. Gastown has some Brooklyn edginess to it, of course, and Nicli’s location at 62 Cordova Street East puts it just a block and a half northwest of the notoriously drug-riddled Main & Hastings intersection. So walking into an establishment with pristine walls and tables gleaming white and lit with candles may make you wonder for a moment if you’re tripping out too. For one thing, Vancouver just doesn’t do pizza well. Everyone from eastern Canada has complained about the poor choices available when they live or visit here. Second, if this city were to have a pizzeria that offers a fine-dining experience, you’d think it would be found in Yaletown, among the $15 martinis and $5 lattes and $200 jeans. Instead, former St. Thomas, Ontario resident Bill McCaig opted to open his authentic Neapolitan pizza place in a former RCMP riding stables, with a vaulted ceiling and spacious main hall on a downtrodden stretch of the city. Taste for yourself and you’ll know why. The thin-crust pies are made in a wood-fired Gianni Acunto oven imported from Italy and specifically designed for pizza. It heats up to 900 degrees Fahrenheit, which creates the delicate texture of the crust. The sauce on the Capricciosa pie ($20) was so deliciously sweet it offered an instant realization of what pizza should taste like. McCaig went into the culinary business after retiring from the waste-management industry in the early 2000s. He studied French cooking and visited Naples, where he had pizza “that was so much better than anything I had ever had.” He worked in Calgary restaurants before coming to Vancouver and taking notice of the awful state of pizza making in the city. 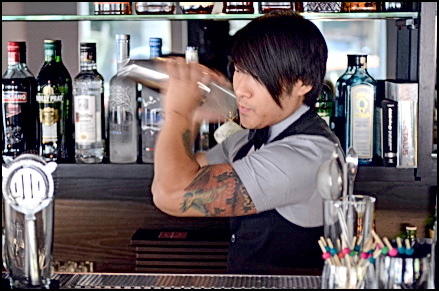 Bar manager Christopher Cho keeps the drinks and the good times coming at Ensemble. VANCOUVER — On the night of the Vancouver riots, while everyone else in the city was consumed with what might catch fire, the staff at the city’s most talked about new restaurant were worried about what might float away. The restaurant in a building that’s been called “cursed” suffered a freak flood that bar manager Christopher Cho said left the dining room covered in three inches of water and forced the restaurant to close for two weeks. “We were called down there early in the morning and when I first heard about it I thought that one of the rioters had smashed in some windows or something,” said Cho. Turns out, a water heater tank had burst, giving the restaurant reason to re-decorate early in its life. 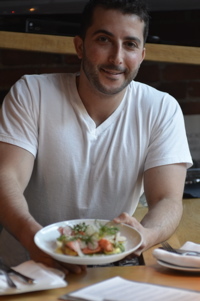 GM Paul Grunberg of L'Abattoir shows off the restaurant's Warm Steelhead and Potato Salad. It might be all of those things but perhaps finding the right category for the food isn’t as important as the adjectives to describe how you feel when you taste it. In a word, L’Abattoir makes life more pleasant. The dishes coming out of Cooper’s kitchen are so velvety smooth in texture and flavour you can get lost in deconstructing it. Whether it’s the silky mushroom and bacon blanquette (a kind of stew typically made from white wine) that covers the delicious Rabbit Cannelloni ($17) or the exquisite flavours from the Warm Steelhead and Potato Salad ($15), L’Abattoir leaves you feeling not only satisfied but mesmerized by dishes that are hard to imagine being replicated in another kitchen. Grunberg and Cooper worked at Market, Jean-Georges Vongerichten’s celebrated restaurant in the two-year-old Shangri-La in Vancouver’s wealthy west end. Cooper also worked for a year at the Fat Duck, the English restaurant that perennially ranks in the top five of the World’s 50 Best Restaurants list. The results of that pedigree are on display in a restaurant that’s wonderfully laid back in attitude and ambience but isn’t loose in service or gastronomical ambitions. Located in a historic building that was once home to the Irish Heather whiskey bar (now moved across the street), L’Abattoir can seat diners in its loft area highlighted by exposed brick or the slender rear hall that faces the rejuvenated Gaoler’s Mews square. Have a few of the Meat Hook cocktails from L'Abattoir and you just may be down for the count. L’Abattoir is one of a handful of high-quality, independently owned restaurants recently opened in Gastown. Those restaurants, which include Bao-Bei and Nicli Antica Pizzeria, are surprisingly affordable for the level of the cuisine they offer. No entrée on the L’Abattoir menu is above $30 and most cocktails from renowned mixologist Shaun Layton are in the $10 range, a fair price when you consider they’re some of the best drinks you’ll find in the country. Layton and his bar staff match Cooper’s unique dishes with inventive flavours of their own. 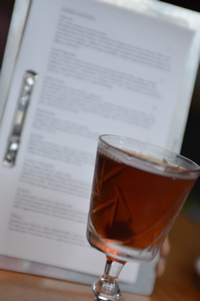 The Donald Draper, named after the “Mad Men” character, is a whimsical take on an Old-Fashioned that balances the sweet and sour tastes of the ingredients: Buffalo Trace bourbon, Pineau De Charentes apertif, Abricot de Rouillson, Peychauds bitters and a rim of Absinthe. The Banana Daiquiri is far from the sweet, dessert-like flavours most people associate with that drink. Layton’s take is a … pleasant surprise. It’s a boozy version of the drink and after one sip your thoughts about what a daiquiri should taste like change forever. VIENNA — About a year ago, a friend of mine came up with the name for The Great Dessert Search — a compilation of the absolute best sweet treats on the planet (or at least near Toronto). With space in the Toronto Star Travel section tight, we haven’t been able to start it up there. So, I’ve decided to run the series here. If you’ve got a dessert you’d like to nominate, let me know, or write about it yourself and send in photos if you have them. First, though, we start with one of the world’s most famous and decadent desserts: The Original Sacher-Torte. This treat has everything a renowned culinary creation should: a global following, a history as rich as its ingredients and the ever-present term “secret recipe” attached to it. First invented in 1832 by Franz Sacher, the treat will remind you of a Black Forest cake but with a much smoother, firmer chocolate icing and a more elegant fruit spread between the two cake layers. The cake’s great history includes a fight over its ownership. 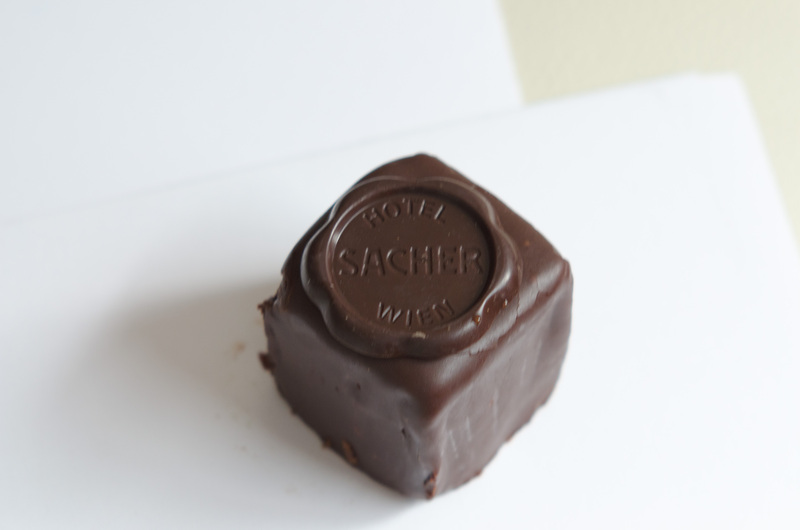 When Sacher invented it, he was a 16-year-old apprentice to the personal chef of a Viennese prince. His son, Edouard, reputedly perfected the recipe while working at Demel bakery. Edouard then started the Sacher Hotel in 1876 and brought the cake with him. 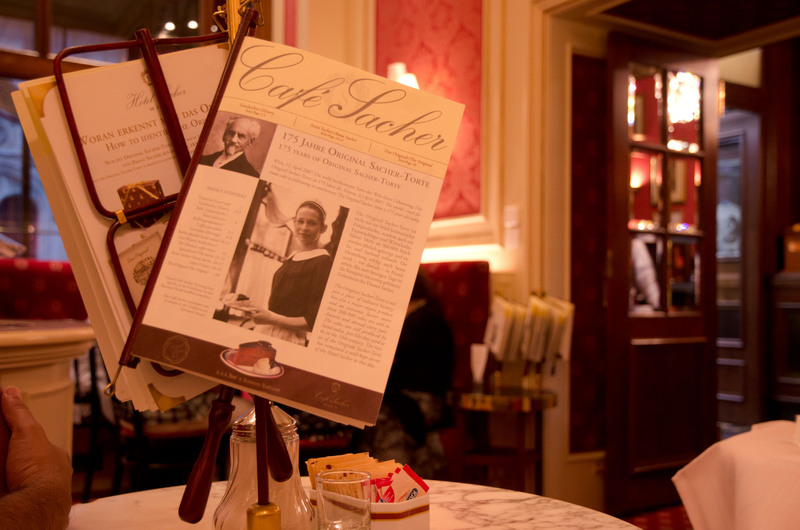 A lawsuit ensued between the hotel and Demel for rights to the name “sachertorte.” Cafe Demel and the Sacher, which are about 600 metres apart in the lovely historic district of the Austrian capital, now serve their own versions of the cake. “The Original Sacher-Torte” (about 4.90 euros, or $6.70, a slice) is what you find at the Sacher Hotel in Vienna and Salzburg, and the “Demel Sachertore” (3.70 euros, or $5.05) is on the menu at the popular café that employs only women in the kitchen. It’s become custom for visitors to Vienna to try both to decide which is best. It’s not a taste test anyone I know of has passed up. While the Sacher Hotel says it still holds the original recipe, the main ingredients are well known. The chocolate sponge cake layers are separated by apricot jam. Dark chocolate icing covers the cake and a chocolate medallion with the Sacher name is pressed to the top of servings at the hotel. A dollop of whipped cream comes with it on the side and a cup of melange (cappuccino-style coffee) is recommended to accompany it. To tell you the truth, the first time I tasted sacher-torte I wasn’t all that impressed. It was earlier this year at Roy Thomson Hall, when a delegation from Vienna were in town for a performance from the city’s famed Philharmonic Orchestra. They brought with them pounds and pounds of the cake to share with Torontonians. I thought it was a touch tart and the chocolate flavours not memorable enough. After a recent stay at the Sacher Hotel, though, I’ve joined the cult.